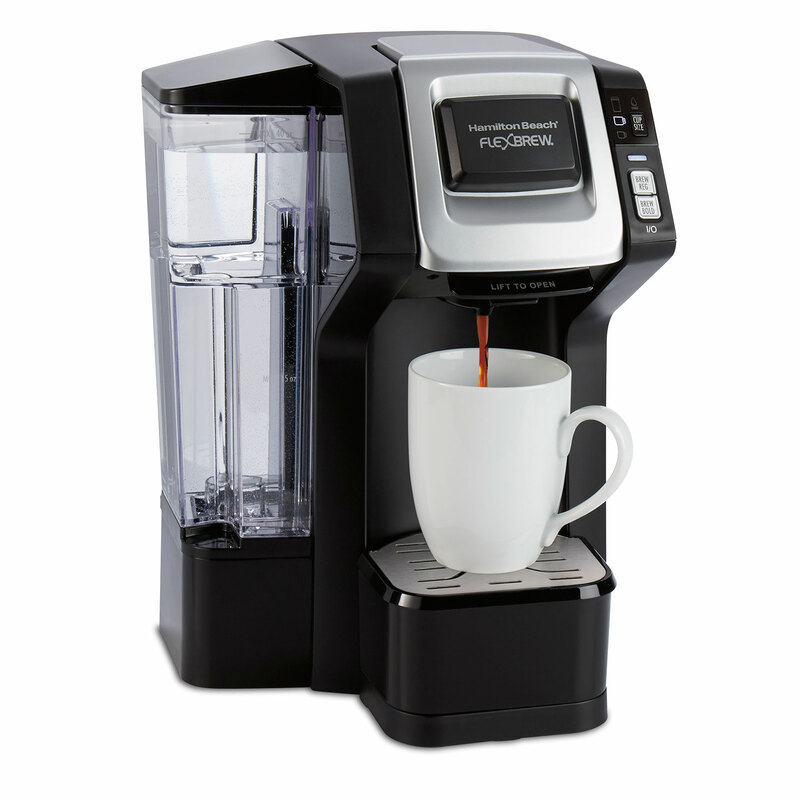 SINGLE-SERVE COFFEE MAKER WITH OR WITHOUT K-CUP PACKS. Brew an 8 oz. or 10 oz. cup using a Keurig®* K-Cup pack, or up to a 14 oz. travel mug using grounds. 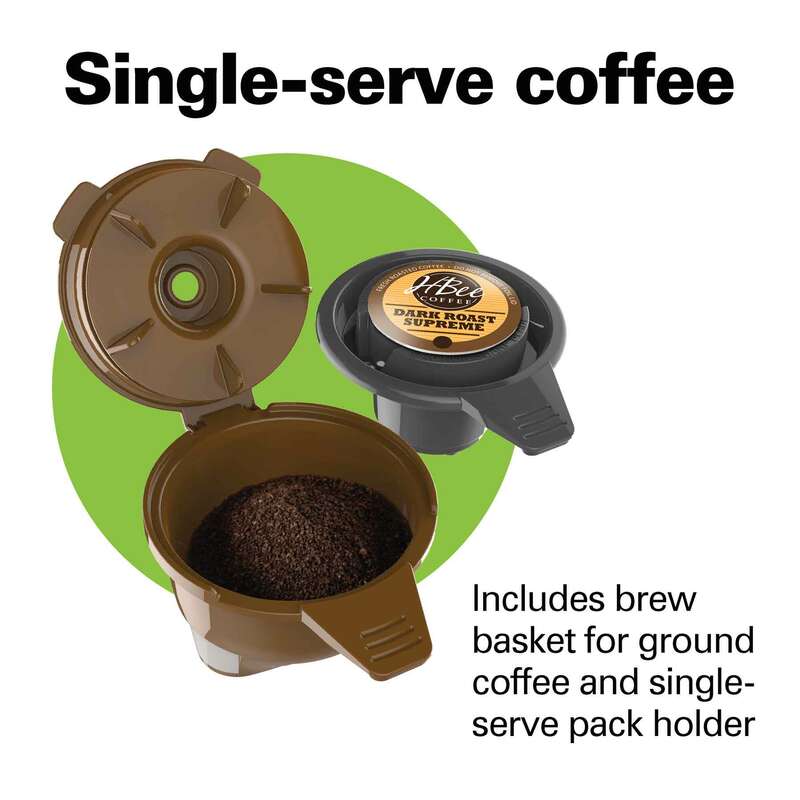 Pack holder and grounds basket are included. 40 oz. REMOVABLE WATER RESERVOIR. The 40 oz. reservoir can be filled in the sink and allows for multiple brews without refilling. When the water gets low, the blue water drop will flash signaling it is time to refill. JUST LOWER LID AND BREW. Whether it’s a single-serve pack or your own fresh grounds, just place them in the holder, lower the lid and press brew. 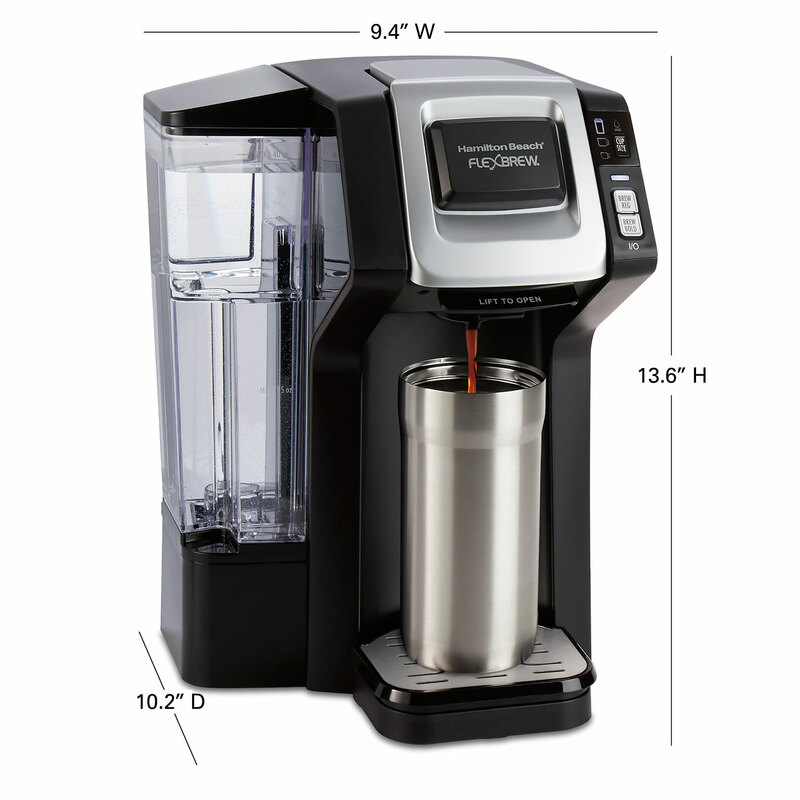 The coffee maker automatically shuts off when brewing is complete. 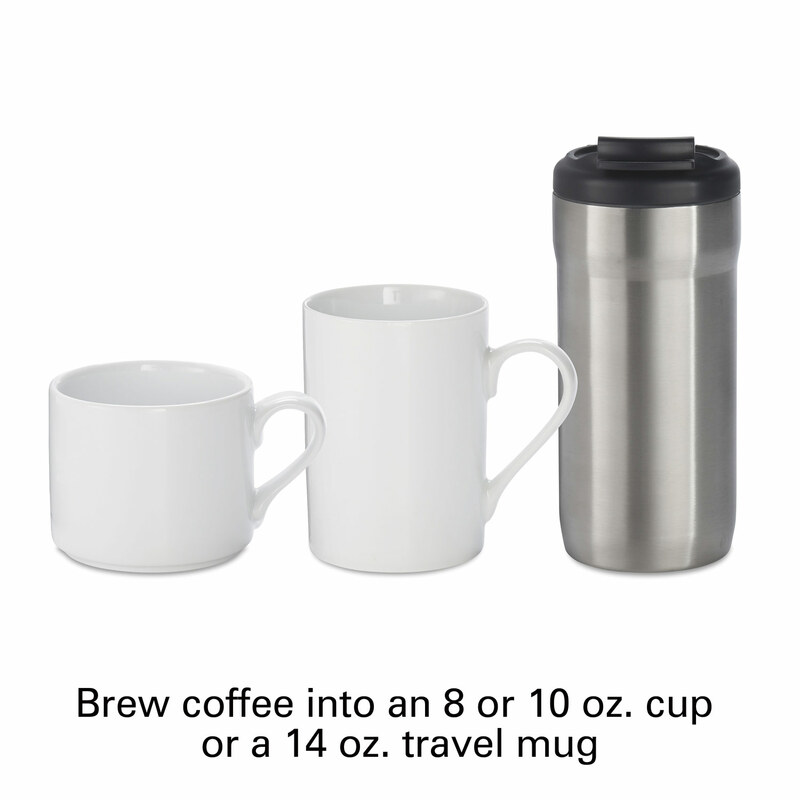 3 BREWING SIZES FIT A VARIETY OF MUGS. Choose from 8 oz. or 10 oz. single-serve packs or up to 14 oz. with grounds. Use the adjustable cup rest to fit your favorite mug in just right. EASY TO CLEAN. The pack-piercing needle removes for easy cleaning to prevent clogging that can sometimes occur with frequent use. Single-serve coffee, brewed your way. 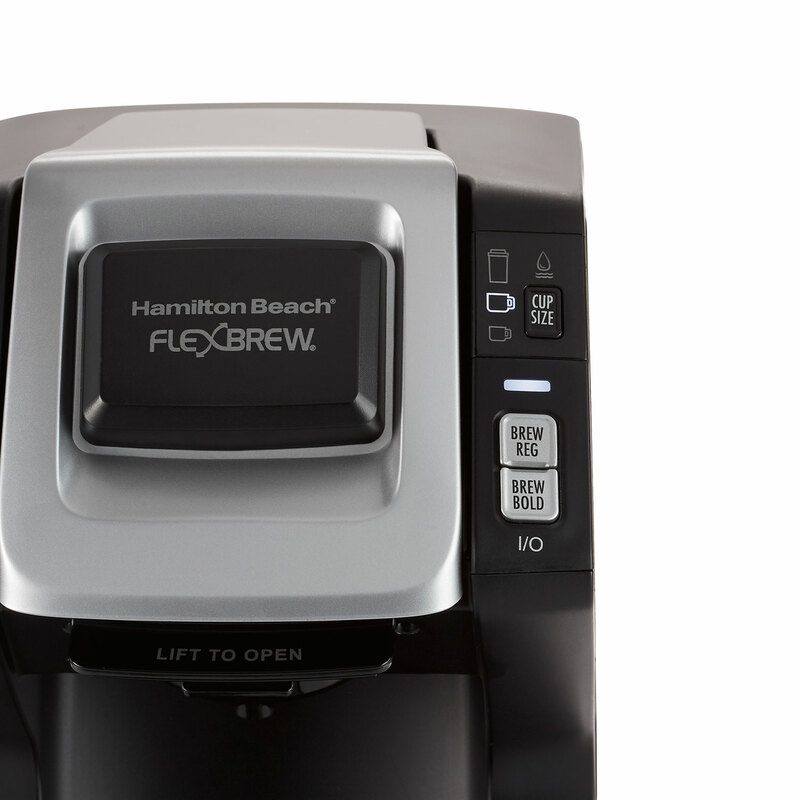 Make a personal cup of coffee with the Hamilton Beach® FlexBrew® Single-Serve Coffee Maker and enjoy the added flexibility of brewing freshly ground coffee and single-serve packs. With just the lowering of the lid and the press of a button, you can have a single cup of hot coffee, brewed from K-Cup®* pods or your own grounds. This single-serve coffee maker lets you brew an 8 oz. or 10 oz. cup of coffee using a single pack, or up to a 14 oz. travel mug using grounds. The 40 oz. 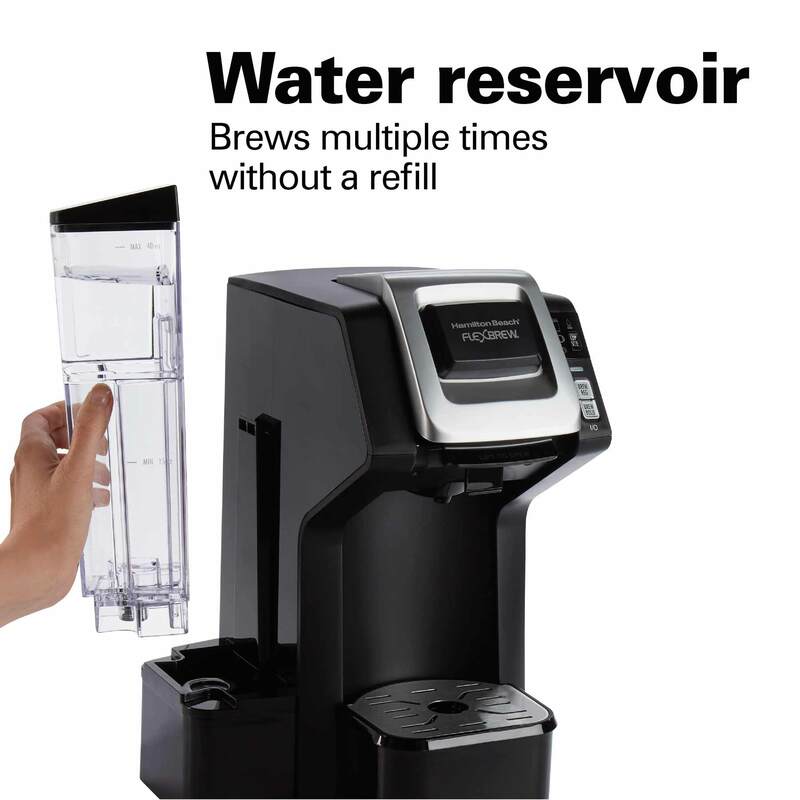 removable reservoir eliminates the need to refill the coffee maker every time you brew. You can also choose between regular or bold brew strength. 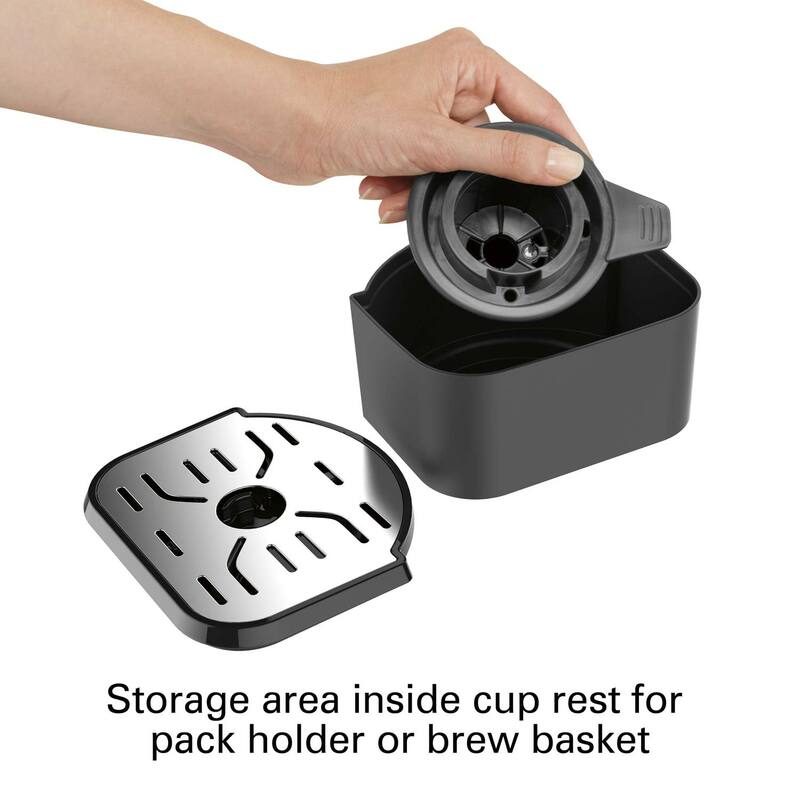 A removable cup rest doubles as a storage container to hold the brew basket or single-serve pack holder when not in use. 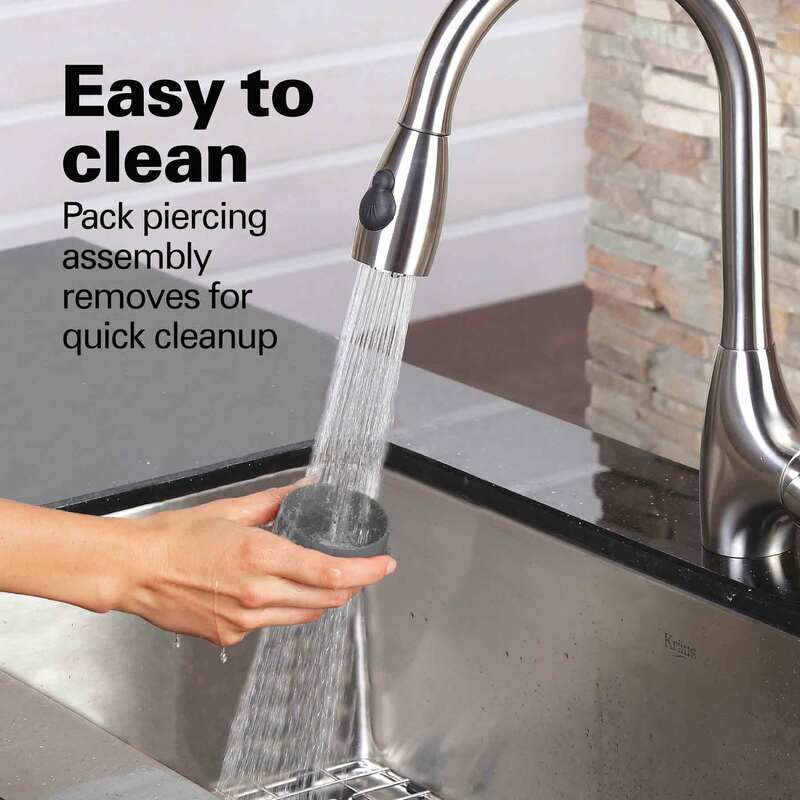 The included grounds basket is reusable, and the single-serve pack-piercing assembly removes for easy cleaning. This water reservoir removes for easy filling and the 40 oz. capacity lets you brew multiple cups of single-serve coffee without the need to refill. The easy-view water window and blue water drop light illuminate when the reservoir needs filling. Whether it’s a single-serve pack or your own fresh grounds, just place them in the holder, lower the chrome-plated lid and press brew. 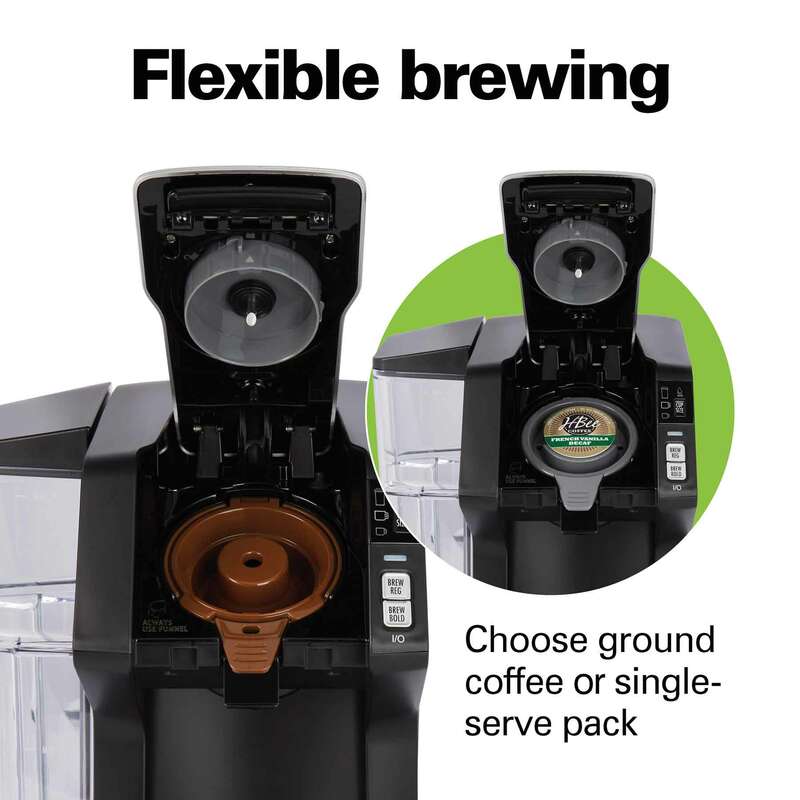 Whether you’re a steadfast pack user or prefer your own grounds, you can do either in the FlexBrew® Single-Serve Coffee Maker. A pack holder and single-serve brew basket are included. Make your own small, medium or large – choose 8 oz., 10 oz. or up to14 oz. when using grounds. Or select 8 oz. or 10 oz. when using a K-Cup pod. Use the adjustable cup rest to not only fit your favorite mug just right, but to also hold the single-serve pack holder or the single-serve brew basket.